Groot cosplayers takes on Dredd, as a gang of sentient trees attack the city in Judge Dredd: Planted. It’s a silly idea, which wrings dark humour from some grisly deaths, and enjoys some characterful art from Jake Lynch and Jim Boswell. It’s full of nice world-building details, such as the Judge who’s clearly sick of his lot and a scientist driven by love, and there’s an odd tangent as we’re introduced to some action-seeking YouTubers...which could go no-where but may well pay off next month. ...and that path continues here, as an aged Marshal Lawson refuses an order to abandon her home, instead taking to the desert. Finally, the secret of her origin is revealed in a quiet and reflective episode. Once again, Phil Winslade’s magnificent line art is a real standout, packed with detail and character. British PSI Judge Storm investigates the death of an architect in Storm Warning: Green And Pleasant Land. This is shaping up to be a nice satire of British politics, as protests break out at the opening of a new train line for the uber-wealthy. Storm Warning has all the grubbiness of a British TV police procedural, which makes a nice difference from the shiny futurism of Dredd. Judge Fear makes his return in The Dark Judges: The Torture Garden. The Dark Judges, minus their buddy Fear, have laid waste to a human outpost on the planet of Dominion, and now Fear will be joining them. Torture Garden has been a strange tale. Its take on the Dark Judges is quite different from any other. The defining feature of the characters has always been a desire to end all life, since it’s the most efficient way to fight crime. David Hines’ version of the characters would rather torture and torment than get the job done. It’s the equivalent of Judge Dredd delighting in beating people up, and only arresting them as an afterthought. Here, things get even stranger as it’s noticed that Space Marine Sabitin, sent to Dominion to save the day, is actually a dangerous lunatic who should be locked in a cell on Earth. There’s no excuse for such poor record keeping. “It’s not the “how” he escaped...it’s the “why””, exclaims Chief Judge Hershey...although the “why" someone might escape from prison is fairly obvious, and the “how” is quite important. 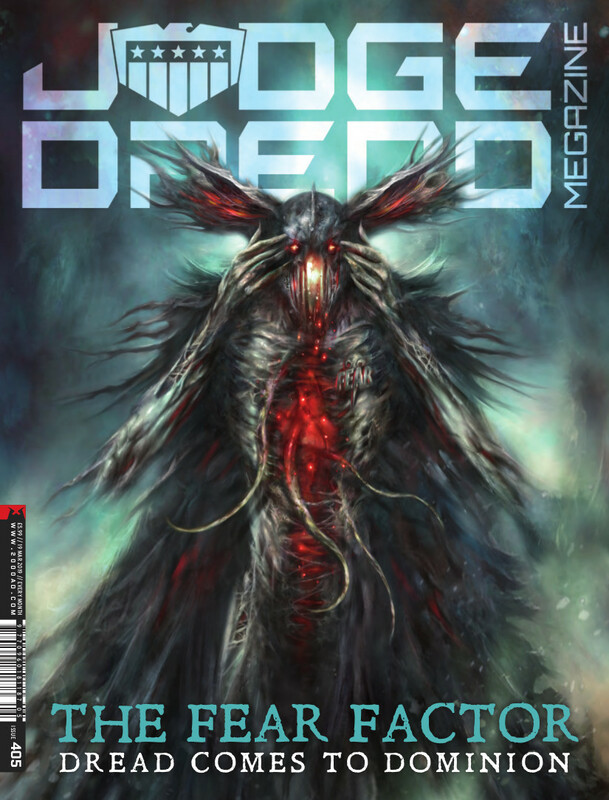 This Meg also includes an article on an upcoming Dredd tabletop game The Cursed Earth from Osprey Games, and an interview with writer Paul Jenkins. It’s topped of with a touching obituary of spitfire pilot and legendary artist Ron Smith, who passed away last month, aged ninety. Mr Smith’s colleagues heap well deserved praise upon the man whose clean lines, lean Dredd, and wonderfully batty characters like Citizen Snork and Otto Sump helped define the strange world of 2000AD.